Ten PhD students will study at University of Liverpool as part of a unique collaboration with the University of Health Sciences (UHS) in Lahore, Pakistan. The agreement was formally ratified during a visit to Liverpool by UHS Vice-Chancellor, Professor Malik Mubbashar. The biggest medical university in Pakistan, UHS currently has 35,000 undergraduate and 4,000 postgraduate students registered. 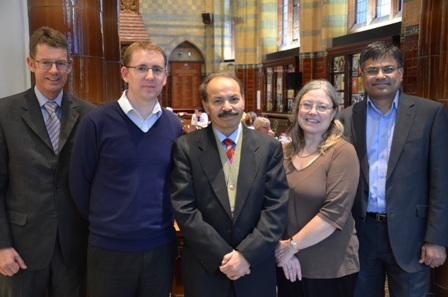 University of Liverpool Professor of Child Psychiatry, Atif Rahman helped bring the partnership to fruition. The collaboration is being led by Dr Ian Willis from the Educational Development Division in the Centre for Lifelong Learning. And for Malik Mubbashar this is just the beginning of what he hopes will be a long association. Applications are now being invited in Pakistan and the project has the backing of the British Council. Good news! The university needs to form more international partnerships of this kind, involving exchanges PhD students and collaboration between academic staff.